American oystercatcher Haematopus palliatus with chicks, photographed by Bear Golden Retriever. The Haematopodidae include the oystercatchers, a cosmopolitan group of primarily coastal birds that feed in loose flocks. 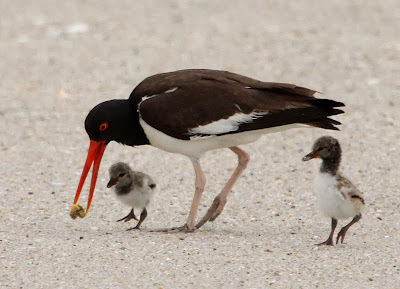 Oystercatchers have black and white or all black plumage, a very long, straight reddish bill, a squat body and pinkish-red legs (Heather & Robertson 1996). [CG99] Carlton, J. T., J. B. Geller, M. L. Reaka-Kudla & E. A. Norse. 1999. Historical extinctions in the sea. Annual Review of Ecology and Systematics 30: 315-338.